8/47 Amanda Jones A chick flick at its core, really. Shockingly appealing. 30/159 David Mumpower Fitting finale redeems the Rocky franchise after embarrasing fifth movie. Stallone did something impressive here. 37/200 Max Braden Though the ending fizzles, Stallone did a great job reviving this series. The speeches are better than the boxing. 41/68 Michael Bentley An admirable ode to the first Rocky, but a bit too similar and mediocre in the middle. Still, a nice bookend to the saga. And so Rocky Balboa, the Italian Stallion, a small-time boxer from Philadelphia completed the Everyman dream and rose to the top of the professional boxing world by knocking off the unbeatable Apollo Creed in their blockbuster rematch. Of course, that was just in the tepid sequel Rocky II. Despite what the Dodgeball gang may have you believe, the first Rocky was a true underdog story. Written by then-unknown Sylvester Stallone the film captured the hearts of the nation during the country’s bicentennial in 1976 and went on to win three Academy Awards including Best Picture. It scored seven other nominations, included the impressive feat of Stallone being nominated for the title of best actor and best original screenplay. The box office smash (earning $117 million in the U.S., unadjusted for inflation) spawned a total of four sequels. Rocky II, III and IV never quite lived up to the expectations set by the original, but were all enjoyable in their own little ways. In part three Rocky faced off against Clubber Lang (played by 1980s sensation Mr. T) and then the fourth installment saw him clash with Russian superhuman Ivan Drago (Dolph Lundgren). But Rocky V was utterly forgettable. It’s been 16 years, but now the sixth edition will soon be released. Perhaps trying to move away from its previous futile effort, it will just be called Rocky Balboa with Stallone reprising his role as the hero. In the film, Rocky, now widowed after the death of his beloved wife Adrian (who was played by Talia Shire), is retired and hasn’t fought for years. One day he watches a special series by ESPN showcasing virtual matches between heavyweight greats, past and present. One such matchup features the great (and younger) Rocky against the current champ, Mason “The Line” Dixon (real-life boxing superstar Antonio Tarver). Younger Rocky wins the virtual battle and older Rocky is inspired by this and realizes how much he misses the sport. This sets him on the course of a showdown with The Line. But his greater trainer Mickey (Burgess Meredith) is of course long gone, so now old pal Paulie (Burt Young) and his son Rocky Jr. (Milo Ventimiglia) are there to help train him. 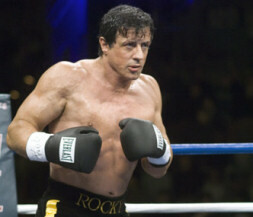 See the latest developments for this project on the Rocky Balboa Movie News page.